What do geriatrician Dr. Jenny Basran and King Julien from the movie Madagascar have in common? 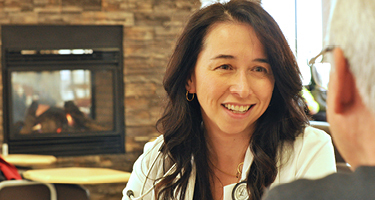 Dr. Basran is passionate about ensuring the province’s growing number of older adults, many of whom are living with chronic illness, receive optimal patient care that meets their increasingly complex needs while at Royal University Hospital. “Advances in modern medicine, ranging from the discovery of vaccines to the use of sophisticated surgical equipment, have played a significant role in extending people’s lives,” says Dr. Basran, Head of Geriatric Medicine for the Saskatchewan Health Authority and the College of Medicine, University of Saskatchewan. Approximately one in five residents in Saskatchewan lives with a chronic illness such as cancer, diabetes, heart/lung disease or stroke, that causes significant suffering, necessitates frequent hospital visits and leads to premature death. And one in seven older adults will have two or more chronic conditions. In fact, it’s a reasonable possibility that you yourself know and care deeply about someone who is living with a chronic condition and have seen first-hand the pain and struggles they endure every day. As do we. That’s why the Foundation has committed to raising $1.8 million to enhance the quality of care and programming available at RUH and in the community to those living with chronic conditions. Your investment in this campaign will support 12 priority chronic care initiatives related to diabetes, cardiac, stroke, cancer and epilepsy to name but a few proposed by RUH clinicians and researchers. Dr. Basran’s proposal, a pilot study called “Mobilization of Vulnerable Elders” (MOVE), focuses on the outcomes associated with implementing early mobilization practices for patients with multiple chronic illnesses. Incorporating an interdisciplinary team approach that includes patients and their families, this initiative will focus on getting patients “up and moving” three times a day. Innovative research, new comprehensive assessment and lifestyle programs, education and new equipment can transform care for Saskatchewan people living with chronic diseases. To support RUH Foundation in this campaign, please donate online. For more information, please call RUH Foundation’s Chief Development Officer Lisa Sands at 306.655.6477.